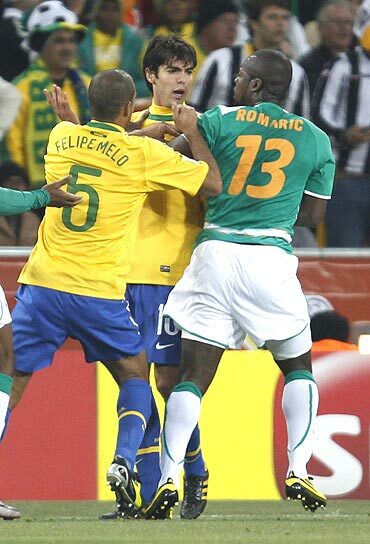 Brazil dented more African hopes in the World Cup on Sunday by outclassing Ivory Coast to sweep into the second round. Five-times champions Brazil beat Ivory Coast 3-1 in Group G with two goals from Luis Fabiano securing their place in the last 16. Brazil's 3-1 victory over one of the stronger African sides in a bad tempered game confirmed Latin American supremacy after Paraguay earlier beat Slovakia. 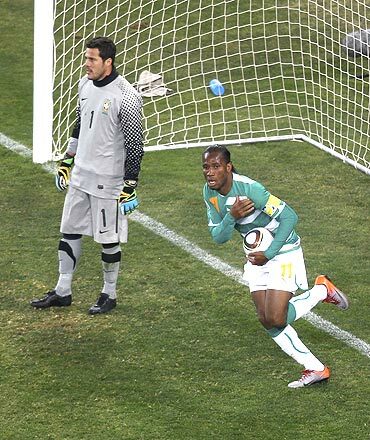 There was a strong suspicion of handball in the second of two goals by Luis Fabiano and Kaka was controversially sent off just before the whistle for a second yellow card, but Brazil never looked in danger despite a late goal from Didier Drogba. Brazil's first three shots on target produced three goals - the first two from Luis Fabiano after 25 and 50 minutes and the third from Elano after 62 minutes. Ivory Coast coach Sven-Goran Eriksson said Fabiano's second goal should not have been allowed. "The first goal Brazil scored was very good," Ivory Coast coach Sven-Goran Eriksson said after the game. "It's difficult to cope with Luis Fabiano and even more difficult if he's allowed to use his hands. 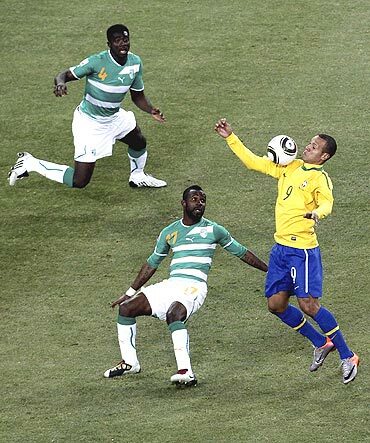 Of course, it's handball, not once by twice," the Swede said. Brazil's perfect record in Group G further sapped African hopes in the continent's first World Cup, with only Ghana now seen with any real chance of qualifying for the second round. Ivory Coast skipper Didier Drogba headed his team's goal after 79 minutes as coach Dunga's men largely outclassed the Africans for their 18th win in their last 20 internationals. Brazil secured their place in the last 16 no matter what happens in Monday's clash between Portugal and North Korea in Cape Town and played well within themselves as they brushed aside the Ivorians. An otherwise poor first half only came to life when Luis Fabiano lashed the ball high into the roof of the net past goalkeeper Boubacar Barry. A smart backheel and a fortunate one-two with Kaka led to the goal while Luis Fabiano showed some nice individual skill, and got the benefit of two dubious handballs for his second 25 minutes later. Fabiano's double ended a lean spell for the Brazilian. "(Coach) Dunga always talks to me and gave me confidence. It was very important the confidence everybody showed in me," the striker said. Elano, who scored in their opening 2-1 win over North Korea made it 3-0 eight minutes later after Kaka crossed from the left leaving Elano with a simple tap-in from close range. Elano was stretchered off shortly afterwards with a shin injury and the Ivory Coast rallied towards the end of the game and have several chances to narrow the deficit.